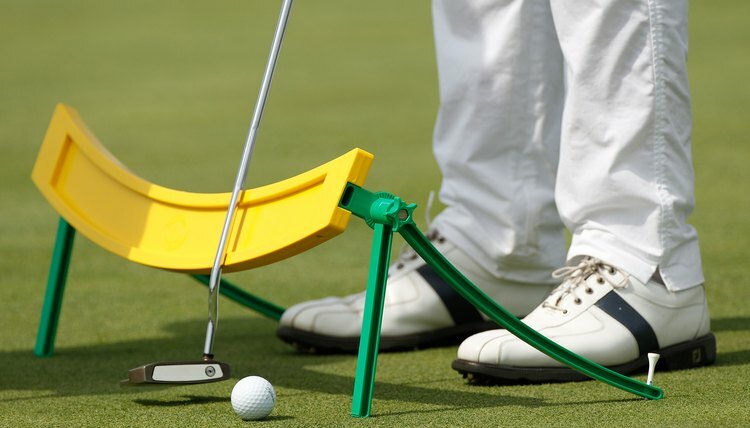 Training aids can help with putting as well as the full swing. Making proper golf swings that achieve desired results take technique, and the key to obtaining or changing a technique is feel. Training aids are critical to the feel process, and they help the golfer recognize proper and improper positioning by feel throughout the golf swing. Training aids are designed to be used by golfers away from the eye a professional instructor. Training aids provide feedback in real time so the golfer can acquire the feel or sensation of the position or movement needed in the swing. This enhances the practice sessions the golfer needs to adapt to the changes and to make the changes lasting. When there is an improper position or movement in the swing that causes a problem, a correction is needed to change or replace that position or movement. Feel has been established as a critical function in this process. A training aid is put in place to create a feel or sensation the golfer can recreate, which, if practiced enough, will then replace the old, improper position or movement. Training aids have a dual purpose: They prevent a golfer from making an improper action or they enhance a proper action. Splaying the elbows at the top of the backswing can cause the club to cross the line, promoting a flipping action with the hands at impact and causing a hook. If a small Nerf ball was placed between the elbows at address and kept between the elbows until after impact, this would help keep the club on line at the top and better synchronize the club coming down into impact, preventing the necessity to flip the club at the ball and causing the hook. The Nerf ball was a positive reinforcement to keep the elbows together. If the elbows splayed apart, the Nerf ball would drop, providing instant feedback of the problem. Appropriate training aids can be wonderful tools if used properly, but they can also be detrimental if used improperly. That is why it is important that when using a training aid, it is used precisely for its designed purposes and used correctly. Todd Pyle is the founder and president of New Millennium Golf. He has 24 years of experience as a professional golfer and 17 years as a Class A PGA Professional. He was a David Leadbetter Golf Academy Director in Ireland and Atlanta and taught with Jim Flick and the ESPN Golf Schools.